The Hiwassee River Basin contains one of the longest rivers in the southern Blue Ridge Smoky Mountain Provinces. The river begins its headwaters along the northern slopes of Rocky Mountain in southern Towns County, Georgia. The often cascading river flows along its path northward before flowing into the waters of Lake Chatuge then continues its journey westward across far western North Carolina, gathering its water twice more into the lake and channel waters of Lake Hiwassee and Lake Appalachia. From there the river crosses the southeastern Tennessee state line before exiting the mountains into the Great Tennessee River Valley below. 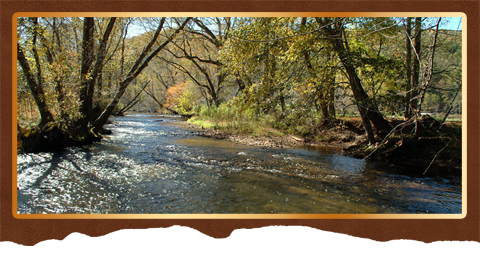 Though the Hiwassee River flows freely across the southern region of Towns County and is both picturesque and ideal for fly-fishing, the majority of the river banks are along private property and not open to public fishing without booking with a professional fishing guide, or going to a private fishing camp site or obtaining personal permission from property owners along the river. Guides have access to the best spots and that’s what it’s all about. The good news is that once the river waters are gathered into the lake its pretty well open season for licensed fishing persons looking to cast their lines. This Highlander Mobi will guide those interested in fishing to several public boat launches onto Chatuge Lake, plus access to booking with a professional fishing guide for local fly fishing or lake fishing. Convenient fishing along the lake’s shoreline where public access is available can be located at Jackrabbit Mountain Recreation Area or below the dam along TVA controlled property.